Penguin and their fabulous classic cover re-designs…again! To the left is an image of two cloth bound series of Classic Literature books released by Penguin in 2008, and designed by Coralie Bickford-Smith. The concept behind these covers is pattern design and each cover follows a different geometrical pattern. In turn, every pattern speaks to the novel’s atmosphere, themes, or period that it was written. 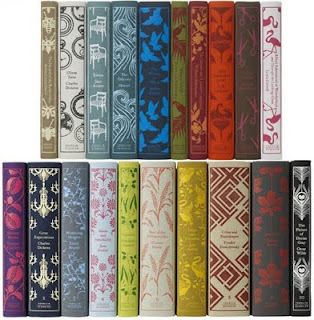 Coralie Bickford-Smith’s favourite design: Crime and Punishment (the third last book on the second row, red and beige). Check out Coralie‘s website for other stunning cover re-designs, or stay tuned to my blog for more of her work coming soon! See the From the Page to the Life’s Stage tab for a list of titles available in this series. These books are available in Chapters/Indigo/Coles stores for $12.99. Click here to find a cool desktop background using these books! Posted on February 12, 2010 February 15, 2010 by LN	This entry was posted in Arthur Conan Doyle, Book covers, Charles Dickens, Charlotte Bronte, D. H. Lawrence, Elizabeth Glaskell, Emily Bronte, from the page to life's stage, Fyodor Dostoevsky, Gustave Flaubert, Homer, jane austen, Lewis Carroll, Louisa May Alcott, Oscar Wilde, Robert Louis Stevenson, Thomas Hardy, Wilkie Collins, William Shakespeare. Bookmark the permalink. I love these covers Lisa! I am drawn to them every time I go into a bookstore. It’s true! I plan on surrounding myself with books on my walls…once I have my own place! But until then I will continue to make book wallpaper for the computer! You know what’s awesome? Those quaint 19th century libraries with floor to ceiling bookshelves. With ladders.